Imagine Sammy Miller or Mick Andrews at the Scottish Six Days Trial, and you’ll probably think of a classic streambed section of slippery rocks and splashing water all around. A slippery rock-strewn stream section is still a great part of many modern trials and is a lot of fun if you’re on your game. 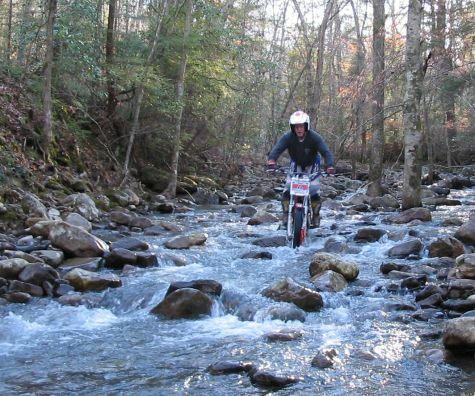 With the nationals season opening this year in April at the Trials Training Center in Tennessee there just MAY be a chance to put your stream section riding skills to work (hint, hint!). So, we gathered the TTC staff (Dan Brown, Charlie Roberts, Ray Peters, Brent and Bruce LeRiche) and had a bull session about the key points for success in wet stream sections. Walk your line and develop a good plan. Since water may conceal some hidden obstacles, you will need to pick some points on the side of the stream or on protruding obstacle to use as visual cues to hold your line. It’s always a good idea to “look ahead,” but especially if water is flowing; if your eyes focus on the moving water it will pull you off line. There’s a reason that the smooth riding old timers usually like these types of sections, because there is a premium on riding smoothly. Be smooth with the throttle, avoiding abrupt throttle blips, and avoid using the clutch as much as possible. You need to maintain a more flexible, open stance with your knees bent to allow the bike to move beneath you. It’s also quite important to keep the front wheel very light and most of your weight on the rear. If the water has been stirred up by previous riders, there may be hidden slippery rocks that have moved since you walked the section, so be flexible! Don’t try to hop, but keep the bike moving with good basic turning technique. It’s obvious that you should have your bike well-prepared and sealed to avoid getting water in the airbox. But you still need to be attentive to some effects water can have on the bike. If cold water comes into contact with the head pipe, the sudden temperature change can lean the bike and cause a stall. So when entering deeper water it is a good idea to keep the revs up slightly. Also, if the day is warm the cold water can reduce the tire pressure a bit from when it was measured. Your feet will stay dry and comfortable if you’ve taken the time to seal your boots before the trial, especially with snow-sealer on the seams and stitches. 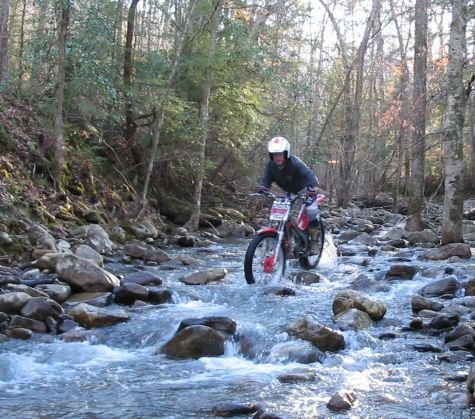 The mental part of trials is extremely important and if you decide that you really enjoy a streambed section in slippery rocks, the chances are that you will! Whenever traction is at a premium, riders with good technique are rewarded and sloppy basic riding skills are revealed. So riding on slippery conditions is a great test of riding skill that will really let you know when your body position or technique is incorrect. With a good plan, a flexible and smooth riding style, and a good mental approach you can be the master of the slippery rock stream sections. And when you come to Tennessee, be sure to smile for the cameras, the shutterbugs love to take your picture with water splashing about! Update: An instructional video by instructors Jim Zuroske and Ryan Young at the 2009 Trials Training Days.